TechEd season for 2017 has ended. Thanks to the hundreds of customers who attended our Screen Personas sessions in Las Vegas, Bangalore and Barcelona. Here are answers to frequently asked questions (FAQ) that we heard in the booth, in sessions, or just in the hallway. 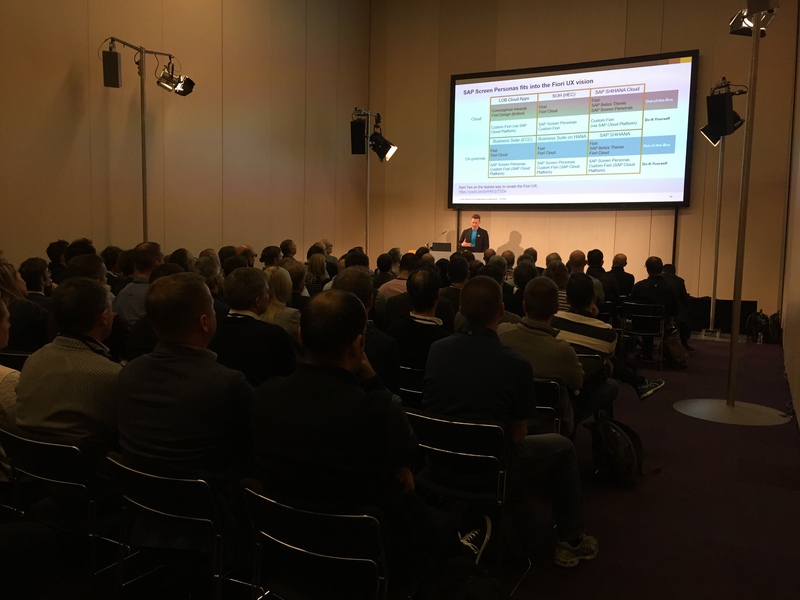 At the end of the post, I have also included a few things that surprised me and the rest of the SAP Screen Personas team supporting the various TechEd events. I am not yet ready for Fiori and SAP S/4HANA, but I’m under big pressure to update the look and feel of my SAP GUI transactions. How can I get started? SAP Screen Personas is a fast and easy way to create the Fiori experience on ECC systems. You can start your journey by taking the Introduction to SAP Screen Personas openSAP course and then the Using SAP Screen Personas for Advanced Scenarios course. Both are free. How do I create Fiori designs in SAP Screen Personas? We have Fiori themes, Fiori templates, Fiori icon sets, along with sample flavors in the SAP Screen Personas Flavor Gallery. Many customers told us about cost and time overruns on their Fiori projects. They decided to try SAP Screen Personas for scenarios where the transactions existed in the form of transaction codes and they just wanted to simplify the screens. What is the best way to get started? Start with www.sapscreenpersonas.com. It has links to many useful resources. If I use SAP Screen Personas – can I create Fiori? Yes, in a way. You can deliver your customers the Fiori experience (simple, role-based, adaptive, coherent, delightful). But the underlying technology will be still be Dynpro or Web Dynpro, rather than UI5 or Swift. Does SAP Screen Personas work with SAP S/4HANA? Yes. Use SAP Screen Personas when you don’t have Fiori coverage. Does SAP Screen Personas run in the SAP GUI for Windows? Yes. Here’s a video on “Running Flavors in SAP GUI for Windows”. Does SAP Screen Personas run in the SAP GUI for Java? Yes. Here’s a video on “Running Flavors in SAP GUI for Java”. Can I run my SAP Screen Personas flavors in the Fiori Launchpad? Yes. Here’s a video about “Using SAP Screen Personas in the Fiori Launchpad”. Can I use SAP Screen Personas on my older system (NetWeaver 7.00)? Here is a list of the system requirements. Will SAP continue to support SAP Screen Personas? Yes, of course. We recently extended our support to five years to align with SAP S/4HANA. Is SAP still innovating in SAP Screen Personas? Yes, of course, See the 2-minute video in which Sam Yen, SAP’s Chief Design Officer, hints at what is coming. When we will be able to view flavors on tablets and mobile phones? Some customers are doing this now, but without support from SAP. When will mobile rendering (finally) be supported in SAP Screen Personas? Soon. We will post updated information on the SAP blogs. Several customers are still on SAP Screen Personas 1.0 or 2.0. Support is running out soon. We recommend you migrate to version 3.0 To simplify the process, we will assign you a “migration angel” as part of our migration program, which runs until January 31, 2018. We encountered an increasing number of Web Dynpro ABAP (WDA) customers that use SAP Screen Personas. Some partners expressed a conflicted relationship with SAP Screen Personas. They love it because they find it so easy to use to simplify screens for their clients. But, when customers see how easy it is to use, they sometimes decide to complete the UX transformation themselves (without the partner involvement). As a result of this phenomenon, one partner shifted their business model to focus on business process improvement and SAP Screen Personas enablement, leaving the screen modifications to their customers. With TechEd now complete, it’s time to shift our focus to SAPPHIRE NOW. The ASUG Annual Conference call for papers is open until December 1, 2017. Please share your UX success story – and earn a free pass to SAPPHIRE.